Core, peel and cut up all but one apple. Boil the apples until soft and mash up. Add a tsp. of vanilla and sugar. Let this mixture go cold. Remove frozen pie crust and let defrost 10 minutes. Pierce bottom with fork then bake the pie crust at 400º for 5 to 6 minutes. Remove from oven and allow to cool down. Once cool, put apple mixture into pie crust. Thinly slice up one apple and arrange on top. Cook pie at 350º for 20 minutes. Put into a small pot two parts jamto one part water and heat (Warm only DO NOT boil). Let cool. Glaze over pie and serve. 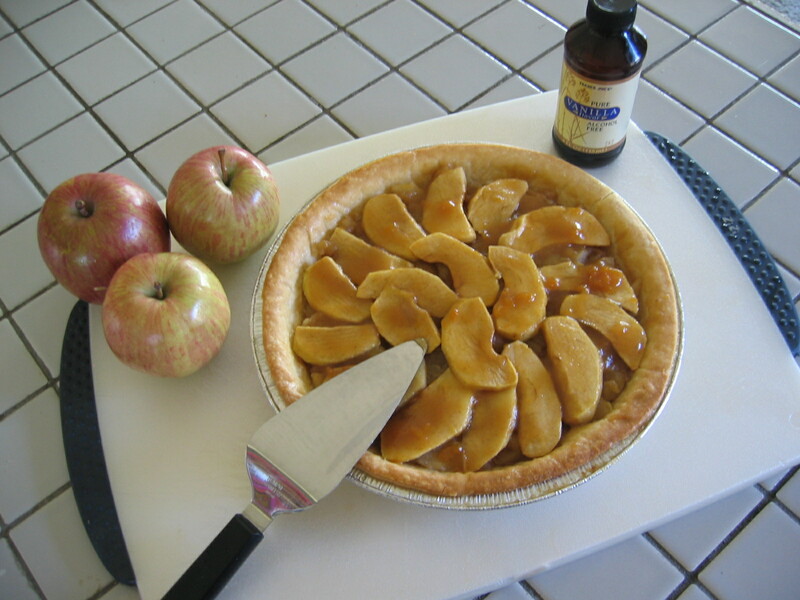 This entry was posted in Recipes and tagged Apple pie, Recipes. Bookmark the permalink.